For the first time in today's #OneDay100k, all the players are located in the same area. 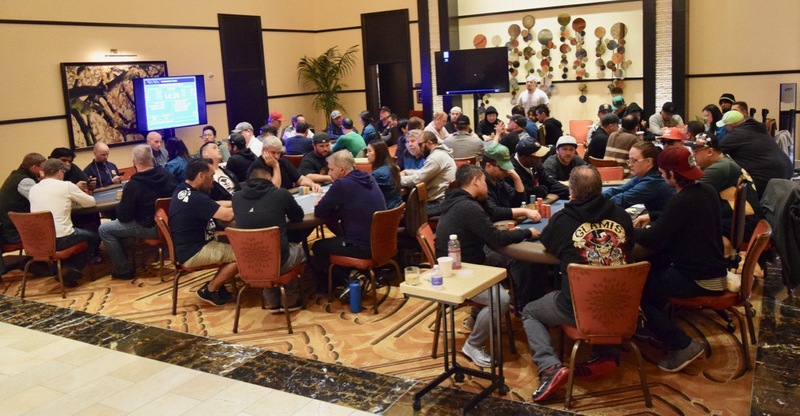 down to 54 players - the final 6 tables - and all action takes place for the rest of the proceedings in the hotel lobby section of the tournament. Among those in the hunt for the $36,717 up top is David Valdez, Spartacus Pincombe, Chris Hinchcliffe, Jeff Spruitenberg, Tim Weimer, Rose Earhart, Bob Mather, Sasha Sabbaghian, Hong Zhang, Josh Morrow, Michael Loncar, Sean Drake, Shannon Kahahane, and everyone else you can identify in the photo above.